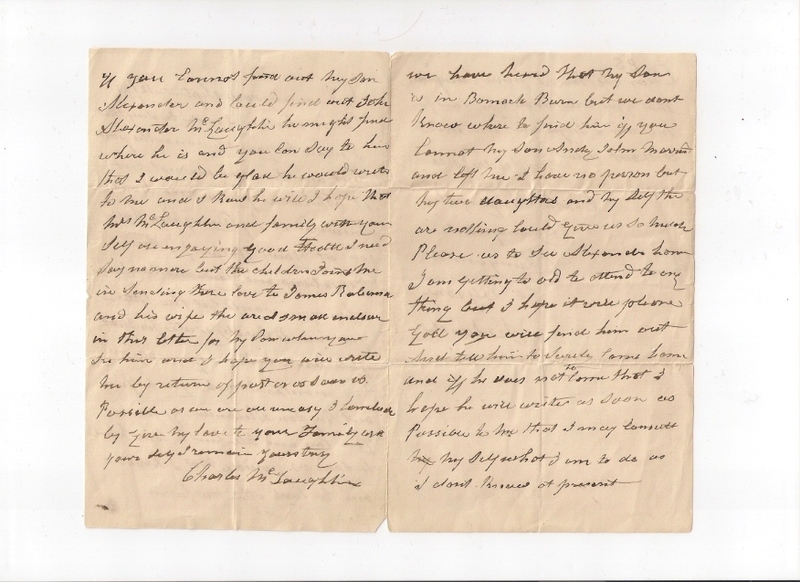 The writer of this letter, dated September 12th 1881 was Charles McLAUGHLIN, a farmer, who died at Donneydade, parish of Clonfeacle, co. Tyrone ten years later on 31st December 1891. It is not yet known who he married, but his family were Sally Elizabeth born c 1838, Alexander born c 1840 (the missing son Alexander referred to in the letter), Andy John, and Mary Ann (known as Annie, and actually Charles' grand-daughter, tho' raised as his daughter). The recipient of the letter was Charles McLaughlin's nephew Seaton McLAUGHLIN, born c 1839, who had emigrated from co Tyrone to Australia and eventually to New Zealand. He was a son of William and Margaret McLaughlin of the townland of Lurgy, parish of Donaghenry. Seaton married in NZ in 1869 to Elizabeth Paterson ROBINSON from Oughterard, parish of Desertcreat. 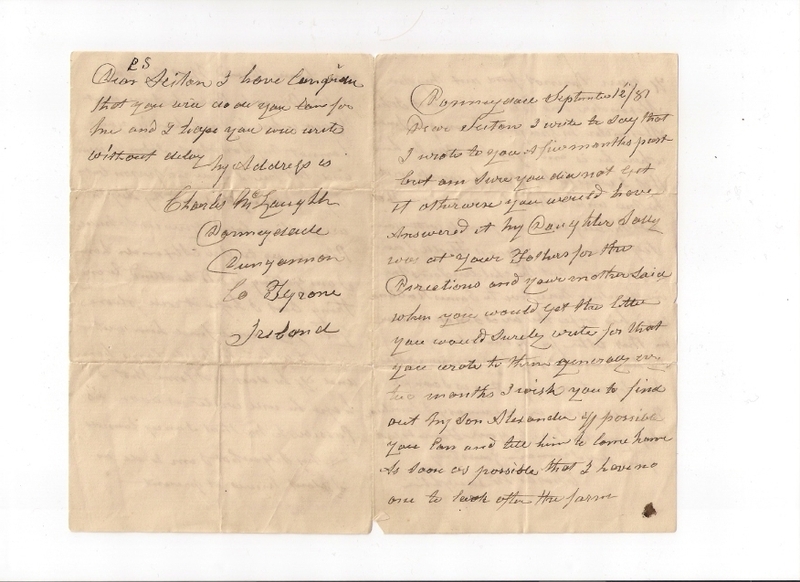 Reference in the letter is made to another nephew, John Alexander McLAUGHLIN, born c 1833 and a son of John McLaughlin of Oughterard, parish of Desertcreat. John Alexander had married in 1854 in Stewartstown to Mary Jane SPENCER, and had emigrated to Australia. Son Alexander never returned to Ireland. Unmarried, and a miner, he died in Dunedin, NZ in 1910.